Bang on time the Summer 2016 issue of the Door Industry Journal was published online early this morning. Extending to 124 pages this edition is packed with content covering industry and product news from all sectors of the door, hardware and gate industries. Our lead story aims to dispel some of the myths surrounding the subject of force testing doors, gates and barriers. Sommer-Time in Stuttgart - a report on a customer visit to the Sommer Group in Germany. Woodrite provide a pictorial glimpse of their new timber sectional garage door. Jewers Doors install a thresholdless Kingfisher sliding door system at Boathouse 4 in Portmouth's Historic Dockyard. Belfox prepare to present their latest offerings at Fencex 2016 in October. Hormann reveal an extensive range of high performance composite doors. Assa Abloy Security Doors supply steel doorsets for Custom House Crossrail station. Sovereign Fire and Security launch a room observation system for the welfare of vulnerable people. Pampered Puss: Urban Front launch a passive house certified designer pet flap. We report on the 95th Anniversary of the Overhead Door Company of America. How much is that doggie in the window - Alutech share a strange request involving a sectional garage door. 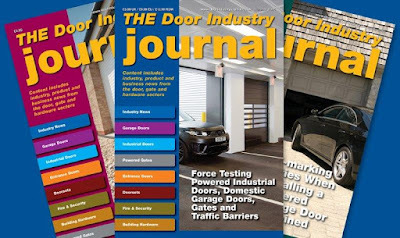 The Door Industry Journal is also available in print, which the majority of people find easier to read. With the above in mind and to expand our printed copy coverage, we have recently signed a deal with iSubscribe to provide us with an online subscription service for the Door Industry Journal. If you are not already a subscriber you can take advantage of a two-year subscription at a discounted rate - saving 17% by signing up here - www.isubscribe.co.uk . Fire Doors. Learn the facts.